So I’ve gotten a little further in development of Android apps. Although I spend a little time each day digging further into Java, I’ve begun using the free App Inventor by MIT for Android. 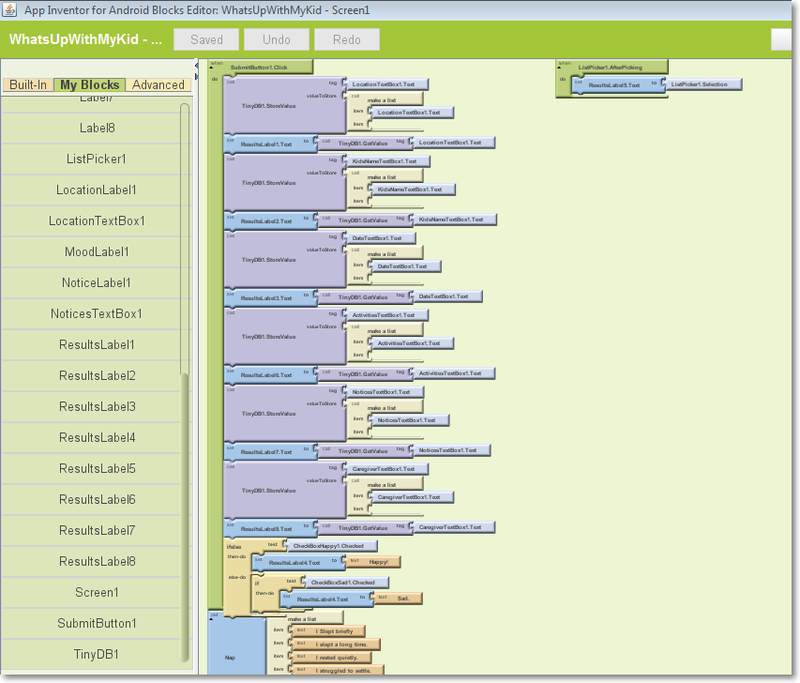 The App Inventor API is a lot like Scratch. UI Objects can be dragged and dropped from the palate onto the viewer. From here, the components used are listed in the component viewer and the properties of each are listed on the right. My first project is a Daily Kids Report where caregivers can fill out a form and then submit it. Once your objects have been placed in the Viewer, the workflow, methods and actions are “coded” with the “Blocks Editor”. Each of blocks that I’ve used are placed into the “My Blocks”. Each block has a set of defined functions and properties that will only fit with other “blocks”. 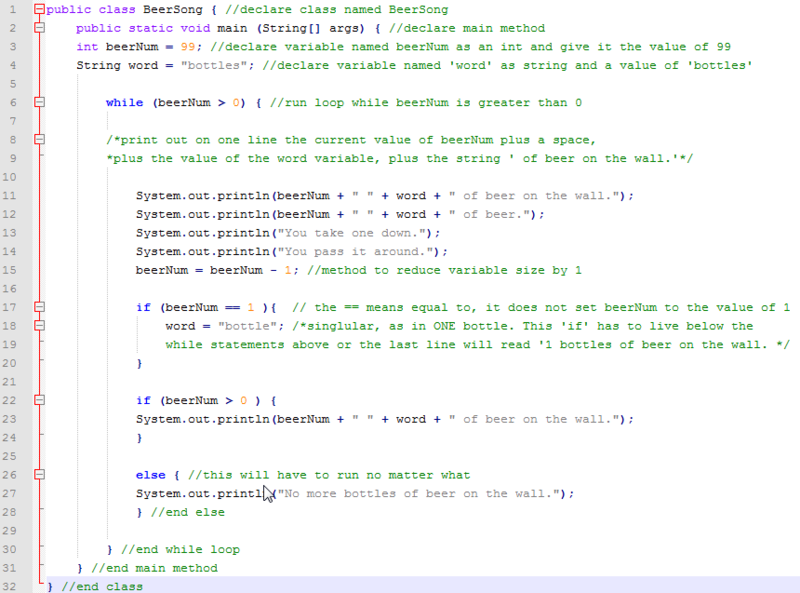 Even a “simple” app can get complicated, but I’ve found this type of programming has accelerated my development goals and is giving me a great introduction into programming structures and logic. Finally, as the app is developed, it’s compiled and run on the fly in an Android Emulator. Once you’re satisfied with the results, you can easily package the app as an .apk that can be installed on a phone (that allows ‘non-signed’ developer mode installs). I’ve gotten to the point where I’m happy with the basic structure and data points the app collects. My next goal is to change the way the Submit button works and have it populate a second Preview screen. Then in the Preview screen, if satisfied with he results, the user has the option to send an SMS text message or email with the information that was entered in an easy to read format. Other ideas I have are to add the ability to include a photo or record a short voice message. 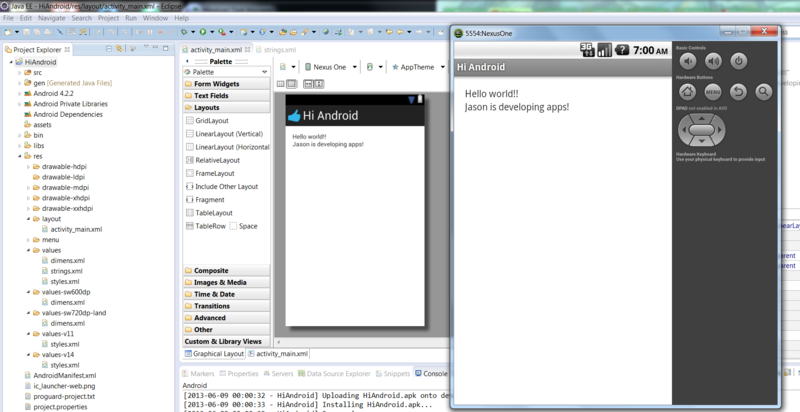 So my foray into Android App development has begun and I’m happy that I have eclipse up and running with the Android SDK. I have a virtual NexusOne up and running my first Hello World App. The only real snag I encountered was being unable to build an .apk and run my first few test apps because of the error: SDK does not have any Build Tools installed. 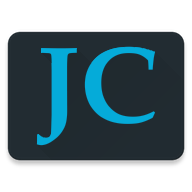 I went to C:UsersJasonandroid-sdks and found that the Build Tools directory was empty (despite running the SDK manager and re-installing the Build-Tools component.) This was resolved by re-downloading the SDK, extracting the zipped files to C:Downloadsadt-bundle-windows-x86_64-20130522 and then manually copied the contents of the Build Tools folder from the unzipped location to my c:users directory. – The first output could be: Bear is a name for a cat. – The second output would probably be a different name and so on. If x starts out as a 0, then it passes the condition of being < 5 so it continues. x is added to 1 so it’s value = 0 + 1 = 1. It is told to print out it’s value as 1 and then add another 1 onto itself, and so on until it’s value is greater than 5, at which time the output ceases due to while condition no longer being true. While, do-while, and for loops always has to pass a conditional test, or an expression that results in a boolean value; either true or false. OK so this java application is not so serious, but it does include a class with a main(), an int and a String variable, a while loop, and an if test. A little more polish and I’ll be building that brewery back end in no time. I recommend the book Head First Java if you want to learn to write Java applications.